In mouse embryo gastrulation, epiblast cells delaminate at the primitive streak to form mesoderm and definitive endoderm, through an epithelial-mesenchymal transition. Mosaic expression of a membrane reporter in nascent mesoderm enabled recording cell shape and trajectory through live imaging. Upon leaving the streak, cells changed shape and extended protrusions of distinct size and abundance depending on the neighboring germ layer, as well as the region of the embryo. Embryonic trajectories were meandrous but directional, while extra-embryonic mesoderm cells showed little net displacement. Embryonic and extra-embryonic mesoderm transcriptomes highlighted distinct guidance, cytoskeleton, adhesion, and extracellular matrix signatures. Specifically, intermediate filaments were highly expressed in extra-embryonic mesoderm, while live imaging for F-actin showed abundance of actin filaments in embryonic mesoderm only. Accordingly, Rhoa or Rac1 conditional deletion in mesoderm inhibited embryonic, but not extra-embryonic mesoderm migration. Overall, this indicates separate cytoskeleton regulation coordinating the morphology and migration of mesoderm subpopulations. In mice, a first separation of embryonic and extra-embryonic lineages begins in the blastocyst at embryonic day (E) 3.5 when the trophectoderm is set aside from the inner cell mass. A second step is the segregation of the inner cell mass into the epiblast, the precursor of most fetal cell lineages, and the extra-embryonic primitive endoderm (Chazaud and Yamanaka, 2016). At E6, the embryo is cup-shaped and its anterior-posterior axis is defined. It comprises three cell types, arranged in two layers: the inner layer is formed by epiblast, distally, and extra-embryonic ectoderm, proximally; the outer layer, visceral endoderm, covers the entire embryo surface. The primitive streak, site of gastrulation, is formed at E6.25 in the posterior epiblast, at the junction between embryonic and extra-embryonic regions, and subsequently elongates to the distal tip of the embryo. The primitive streak is the region of the embryo where epiblast cells delaminate through epithelial-mesenchymal transition to generate a new population of mesenchymal cells that form the mesoderm and definitive endoderm layers. All mesoderm, including the extra-embryonic mesoderm, is of embryonic epiblast origin. At the onset of gastrulation, emerging mesoderm migrates either anteriorly as so-called embryonic mesodermal wings, or proximally as extra-embryonic mesoderm (Arnold and Robertson, 2009; Sutherland, 2016). Cell lineages studies showed that there is little correlation between the position of mesoderm progenitors in the epiblast and the final localization of mesoderm descendants (Lawson et al., 1991). Rather, the distribution of mesoderm subpopulations depends on the temporal order and anterior-posterior location of cell recruitment through the primitive streak (Kinder et al., 1999). Posterior primitive streak cells are the major source of extra-embryonic mesoderm, while cells from middle and anterior primitive streak are mostly destined to the embryo proper. However, there is overlap of fates between cells delaminating at different sites and timings (Kinder et al., 1999; Kinder et al., 2001). Extra-embryonic mesoderm contributes to the amnion, allantois, chorion, and visceral yolk sac. It has important functions in maternal-fetal protection and communication, as well as in primitive erythropoiesis (Watson and Cross, 2005). Embryonic mesoderm separates into lateral plate, intermediate, paraxial and axial mesoderm, and ultimately gives rise to cranial and cardiac mesenchyme, blood vessels and hematopoietic progenitors, urogenital system, muscles and bones, among others. 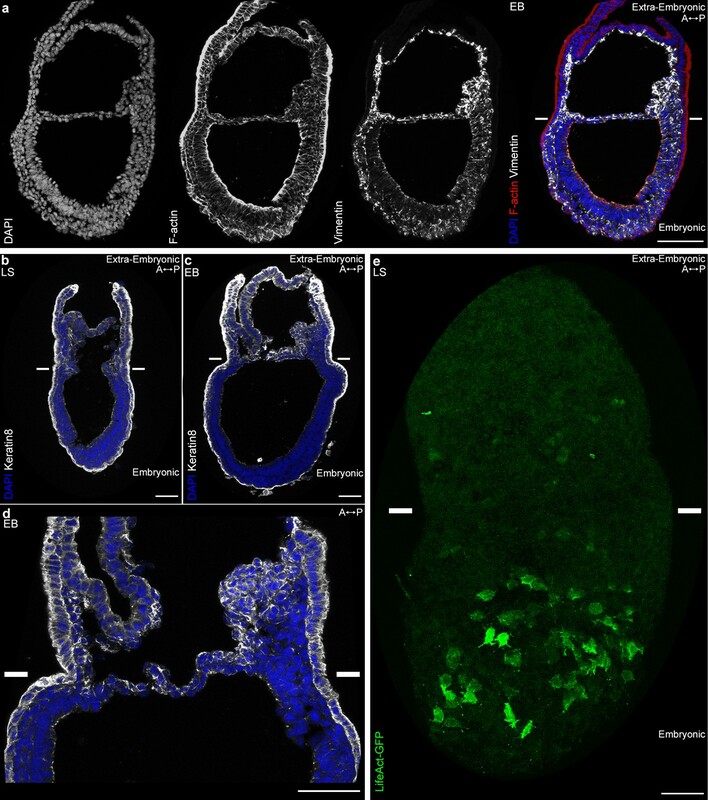 Endoderm precursors co-migrate with mesoderm progenitors in the wings and undergo a mesenchymal-epithelial transition to intercalate into the visceral endoderm (Viotti et al., 2014). Mesoderm migration mechanisms have mostly been studied in fly, fish, frog and chicken embryos. During fly gastrulation, mesodermal cells migrate as a collective (Bae et al., 2012). In the fish Fundulus heteroclitus, deep cells of the dorsal germ ring move as loose clusters with meandering trajectories (Trinkaus et al., 1992). At mid-gastrulation, zebrafish lateral mesoderm cells are not elongated and migrate as individuals along indirect paths, while by late gastrulation, cells are more polarized and their trajectories are straighter, resulting in higher speed (Jessen et al., 2002). In zebrafish prechordal plate, all cells have similar migration properties but they require contact between each other for directional migration (Dumortier et al., 2012). In chick, cells migrate in a very directional manner at high density. Cells are continually in close proximity, even though they frequently make and break contacts with their neighbors (Chuai et al., 2012). Relatively little is known about mesoderm migration in mice because most mutant phenotypes with mesodermal defects result from anomalies in primitive streak formation, mesoderm specification, or epithelial-mesenchymal transition (Arnold and Robertson, 2009), precluding further insight into cell migration mechanisms. We previously identified a role for the Rho GTPase Rac1, a mediator of cytoskeletal reorganization, in mesoderm migration and adhesion (Migeotte et al., 2011). Recent advances in mouse embryo culture and live imaging have overcome the challenge of maintaining adequate embryo growth and morphology while performing high-resolution imaging. It facilitated the uncovering of the precise spatial and temporal regulation of cellular processes and disclosed that inaccurate conclusions had sometimes been drawn from static analyses (Viotti et al., 2014). 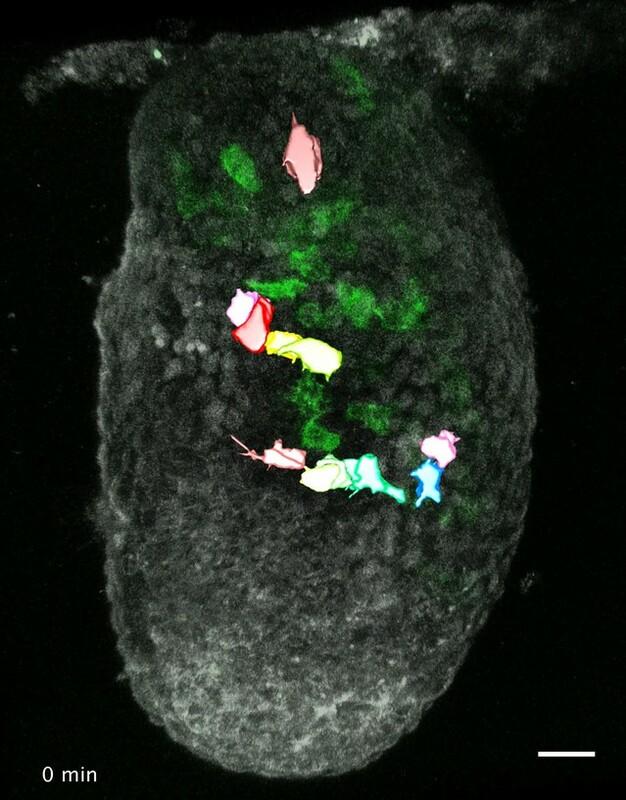 Live imaging of mouse embryos bearing a reporter for nuclei has pointed towards individual rather than collective migration in the mesodermal wings (Ichikawa et al., 2013). 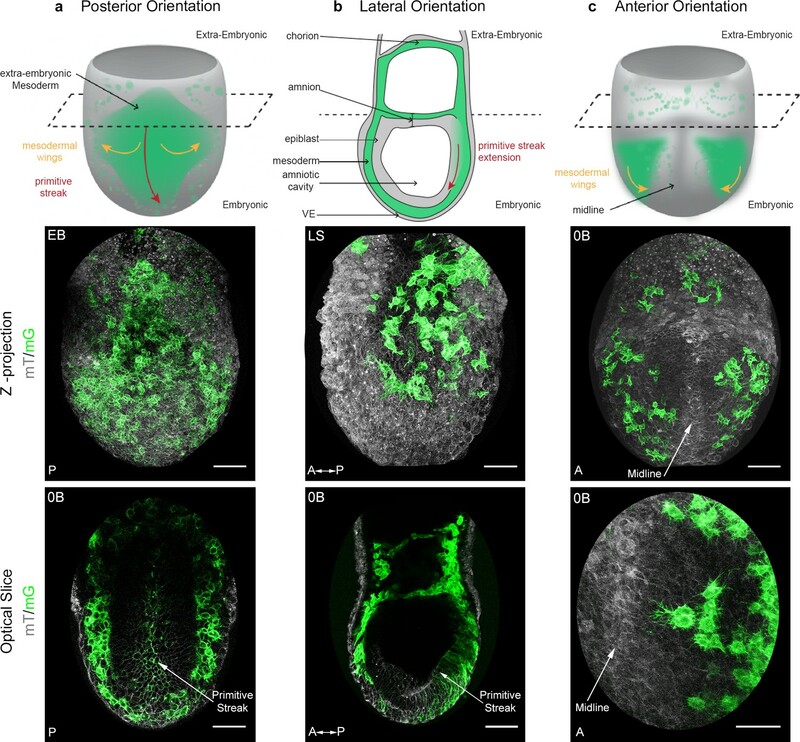 Very recently, a spectacular adaptive light sheet imaging approach allowed reconstructing fate maps at the single cell level from gastrulation to early organogenesis (McDole et al., 2018). However, little is known about how mesoderm populations regulate their shape and migration mechanisms as they travel across distinct embryo regions to fulfill their respective fates. 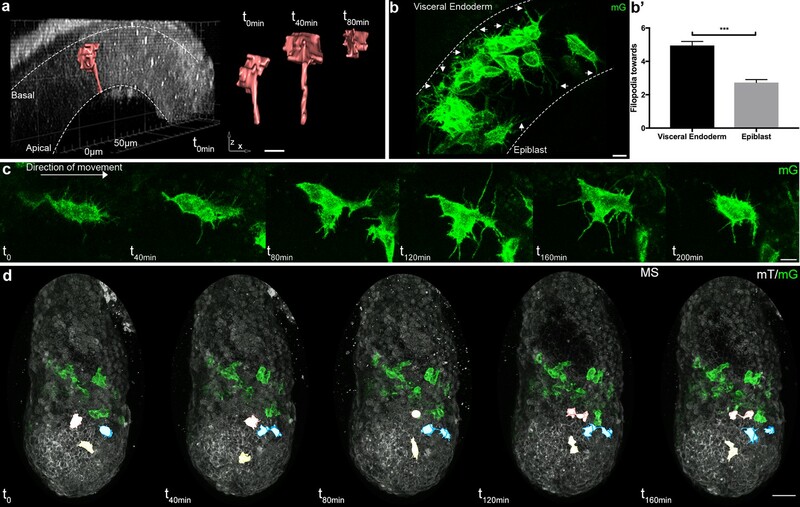 Here, high-resolution live imaging of nascent mesoderm expressing membrane-bound GFP was used to define the dynamics of mesoderm cell morphology and its trajectories. Mesoderm cells exhibited a variety of cell shape changes determined by their spatial localization in the embryo, and the germ layer they were in contact with. The embryonic mesoderm migration path was meandrous but directional, and depended on the Rho GTPases Rhoa and Rac1. Extra-embryonic mesoderm movement was, strikingly, GTPases independent. Transcriptomes of different mesoderm populations uncovered specific sets of guidance, adhesion, cytoskeleton and matrix components, which may underlie the remarkable differences in cell behavior between mesoderm subtypes. The T box transcription factor Brachyury is expressed in posterior epiblast cells that form the primitive streak, maintained in cells that delaminate through the streak, then down-regulated once cells progress anteriorly in the mesodermal wings (Wilkinson et al., 1990). In order to visualize nascent mesoderm, Brachyury-Cre (hereafter referred to as T-Cre) transgenic animals, in which a construct encoding Cre cDNA fused to the regulatory elements of the Brachyury gene directing gene expression in the primitive streak was randomly inserted (Feller et al., 2008; Stott et al., 1993), were crossed to a membrane reporter line: Rosa26::membrane dtTomato/membrane GFP (Muzumdar et al., 2007) (referred to as mTmG) (Figure 1). In T-Cre; mTmG embryos, primitive streak and mesoderm-derived cells have green membranes (mG), whereas all other cells have red membranes (mT). Embryos dissected at E6.75 or E7.25 were staged according to Downs and Davies (1993) (Figure 1—figure supplement 1a) and examined in different orientations by confocal or two-photon excitation live imaging for 8 to 12 hr (Figure 1, Figure 1—figure supplement 1c and d, Videos 1 and 2). Conversion of mT to mG was first observed at Early/Mid Streak (E/MS) stage, and was initially mosaic, which facilitated the tracking of individual migrating cells with high cell shape resolution. 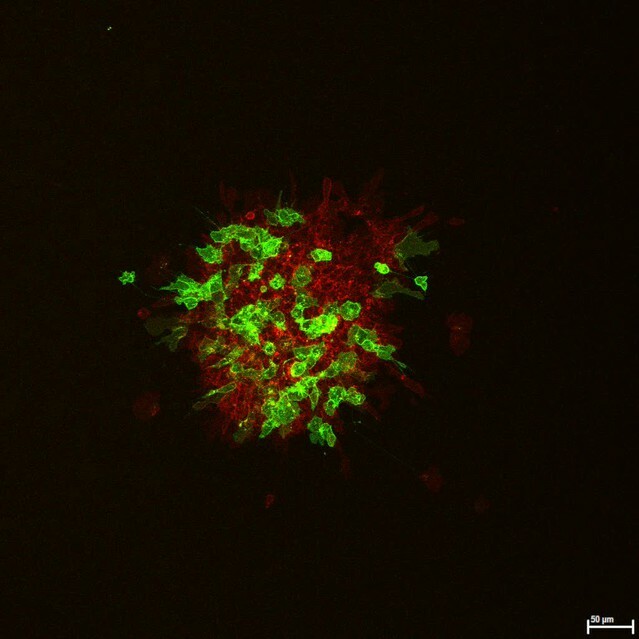 From Mid/Late Streak (M/LS) onwards, most primitive streak cells underwent red to green conversion (Figure 1—figure supplement 1e,f). 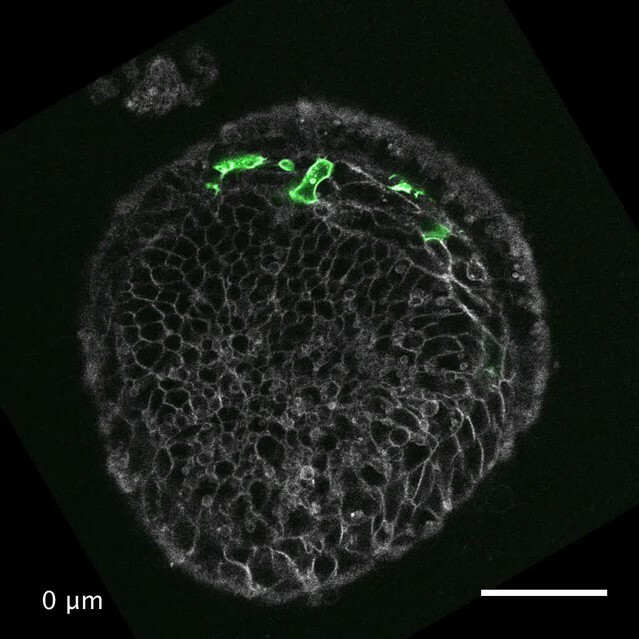 Mosaic membrane GFP labeling of nascent mesoderm allows following individual cell migration through embryo live imaging. (a) Posterior view. Top: 3D scheme with mesoderm layer in green and the rest of the embryo in grey. The dashed line separates embryonic and extra-embryonic regions. Middle: Z-projection of two-photon stack. Bottom: optical slice highlighting the primitive streak. (b) Lateral view, anterior to the left. Top: 2D scheme. Middle: Z-projection of two-photon stack showing cells progression from posterior to anterior. Bottom: sagittal optical slice. (c) Anterior view. Top: 3D scheme. Middle: Z-projection of two-photon stack with most anterior cells reaching the midline. Bottom: optical slice zoomed on filopodia extending towards the midline. All embryos were dissected at E7.25 and are at Late Streak/Early Bud stage. VE: Visceral Endoderm; mG: membrane GFP, in green; mT: membrane dtTomato, in grey; EB: Early Bud; LS: Late Streak; 0B: Zero Bud. (Scale bars: 50 μm). Mesoderm cells migrating towards extra-embryonic and embryonic regions. Z-projections of confocal stacks from a T-Cre; mTmG embryo dissected at E6.75 (Early Streak stage) and imaged for 320 min. Mesoderm cells express membrane GFP (green); all other cells express membrane dtTomato (red). Anterior oblique orientation with posterior to the right (scale bar: 50 μm). Z-projections of confocal stacks from a T-Cre; mTmG embryo dissected at E6.75 (Mid Streak stage) and imaged for 260 min. Mesoderm cells express membrane GFP (green); all other cells express membrane dtTomato (red). Anterior oblique orientation with posterior to the right (scale bar: 50 μm). 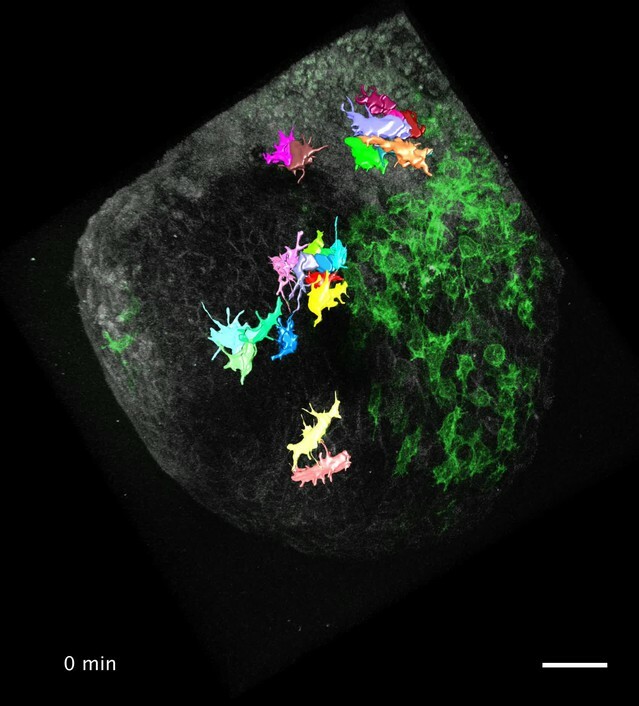 3D snapshots of confocal stacks from a T-Cre; mTmG embryo dissected at E6.75 (Early Streak stage) and imaged for 180 min, with manually highlighted cells tracked throughout the time lapse. 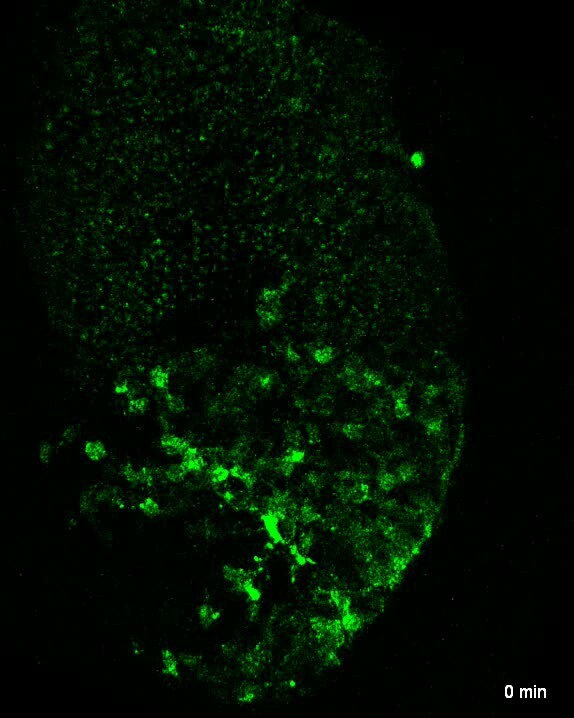 Video shows highlighted cells first, then the original images (membrane GFP, in green) in a looping fashion for comparison. All other cells express membrane dtTomato (grey). Lateral orientation with anterior to the left (scale bar: 50 μm). 3D snapshots of confocal stacks from a T-Cre; mTmG embryo dissected at E6.75 (Early Streak stage) and imaged for 160 min, with manually highlighted cells tracked throughout the time lapse. 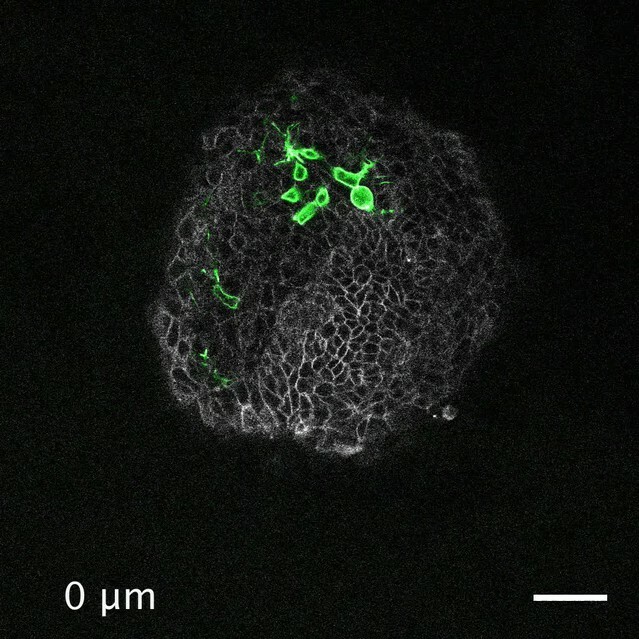 Video shows highlighted cells first, then the original images (membrane GFP, in green) in a looping fashion for comparison. All other cells express membrane dtTomato (grey). Lateral orientation with anterior to the left (scale bar: 50 μm). The shape of mesoderm cells and their tracks were recorded through imaging of embryos from different perspectives between ES and Early Bud (EB) stages of development, in order to obtain images of optimal quality for each embryo region (Figure 1 and Videos 1 and 2). Posterior views (Figure 1a) showed proximal to distal primitive streak extension and basal rounding of bottle-shaped cells exiting the streak, as previously described (Williams et al., 2012). Lateral views (Figure 1b) allowed comparing cells as they migrated laterally in mesodermal wings, or proximally in extra-embryonic region. Anterior views (Figure 1c) showed cell movement towards the midline. The imaging time frame did not allow following individual cells from their exit at the primitive streak to their final destination. However, the trajectories we acquired (Videos 3 and 4) fitted with the fate maps built using cellular labeling or transplantation (Kinder et al., 1999; Kinder et al., 2001), or adaptive light sheet microscopy (McDole et al., 2018). The first converted (GFP positive) cells in ES embryos dissected around E6.75 usually left the posterior site of the primitive streak to migrate towards the extra-embryonic compartment. Embryonic migration started almost simultaneously, and migration towards both regions proceeded continuously. Strikingly, migration behavior (Figure 2a, Videos 3 and 4) and cell shape (Figure 2b) were different depending on the region cells migrated into. In the embryonic region, mesoderm cells had a global posterior to anterior path, even though they zigzagged in all directions (proximal-distal, left-right, and even anterior-posterior). Cells did not migrate continuously, but showed alternations of tumbling behavior with straighter displacement, as described for zebrafish mesendoderm progenitors (Diz-Muñoz et al., 2016). Embryonic mesoderm cells from ES/MS embryos tracked for 2.5 hr moved at a mean speed of 0.65 µm/min to cover approximately 90 µm and travel a net distance of 40 µm (Figure 2a', Table 1). Straightness (the ratio of net over travel displacement, so that a value of 1 represents a linear path) was approximately 0.5 (Figure 2a', Table 1). Cells in the extra-embryonic region moved slightly slower (0.45 µm/min) to do approximately 70 µm, but their net displacement (20 µm) and straightness (0.3) were significantly smaller, reflecting trajectories with no obvious directionality (Figure 2a', Table 1, and Video 5). Tracking details for embryonic and extra-embryonic mesoderm. Cells were tracked for approximately 150 min. P values were calculated using the Mann–Whitney–Wilcoxon. Data can be found in Figure 2—source data 1. Embryonic and extra-embryonic mesoderm populations have different morphology and migration pattern. (a) Z-projections of confocal stacks from a T-cre; mTmG embryo dissected at E6.75 (Early Streak), with cell migration tracking for 120 min. Anterior to the left. White lines mark the embryonic/extra-embryonic boundary. (Scale bar: 50 μm). (a’) Quantification (mean ± SEM) of travel and net displacement (Left) and path straightness (Right, on a scale of 0 to 1) of embryonic (black, n=34 from 4 Early/Mid Streak embryos) and extra-embryonic (grey, n=17 cells) mesoderm cells. Data can be found in Table 1 and Figure 2—source data 1. (b) Embryonic and extra-embryonic mesoderm cell shapes (images extracted from 4 Late Streak embryos) (Z-projections of two-photon stacks, scale bar: 10 μm). (b’) Left: Long/short axis ratio of 2D inner ellipse as quantification of cell stretch (mean ± SEM, n=85 embryonic cells in black, n=83 extra-embryonic cells in grey, out of 8 Mid Streak to Zero Bud stages embryos). Right: Quantification (mean ± SEM) of number of filopodia per cell per time point, in embryonic (black, n=167 cells out of 5 Mid Streak to Early Bud stages embryos) and extra-embryonic (grey, n=28 cells) mesoderm cells. Data can be found in Table 2, Figure 2—source data 2 and 3. P values were calculated using the Mann–Whitney–Wilcoxon. mG: membrane GFP, in green; mT: membrane dtTomato, in grey. Extra-embryonic mesoderm migration is characterized by low net displacement. Z-projection of confocal stack from a T-Cre; mTmG embryo dissected at E6.75 (Early Streak stage) and imaged for 860 min cropped to show extra-embryonic mesoderm cells. Mesoderm cells express membrane GFP (green) (scale bar: 10 μm). Extra-embryonic cells were twice larger in volume, and more elongated (Figure 2b,b', Table 2). The increased size can be attributed to a lower frequency of division (Figure 1—figure supplement 1b). They had few large protrusions, and filopodia were scarce and short (Figure 2b,b', Table 2). Cell shape, size, and filopodia comparison between embryonic and extra-embryonic mesoderm. P values were calculated using the Mann–Whitney–Wilcoxon for surface, long/short axis and filopodia/cell/time point and the t test for volume, and filopodia length. Data can be found in Figure 2—source data 2 and 3. Cells passing through the primitive streak were, as reported (Ramkumar et al., 2016; Williams et al., 2012), bottle shaped with a basal round cell body and an apical thin projection (Figure 3a). Mesoderm cells in contact with the epiblast and visceral endoderm sent thin protrusions towards their respective basal membranes (Figure 3b,b', and Video 6). Interestingly, the density of thin protrusions was much higher in cells in contact with the visceral endoderm. As this phenotype was observed as early as ES in the posterior region, it could reflect the putative signaling role of the proximal posterior visceral endoderm, which remains coherent along gastrulation (Kwon et al., 2008). Intercalation of prospective definitive endoderm cells in the visceral endoderm layer, which occurs from LS stage onwards (Viotti et al., 2014), was very rarely observed, either because Brachyury does not label endoderm progenitors (Burtscher and Lickert, 2009), or because the T-Cre transgenic line does not bear the regulatory elements driving T expression in prospective endoderm. Cells in tight clusters surrounded by other mesoderm cells in the wings had a smoother contour, with the caveat that protrusions couldn’t be visualized between cells of similar membrane color. Reconstruction of cells in the anterior part of the wings, where recombination was incomplete, showed thin protrusions between mesoderm cells (Figure 1c). Cells also extended long broad projections, which spanned several cell diameters and were sent in multiple directions before translocation of the cell body, in what seemed a trial and error process (Figure 3c and Videos 1, 2 and 7). The presence of potential leader cells could not be assessed, as the first cells converted to green are not the most anterior ones (Figure 1—figure supplement 1e). Nonetheless, cells with scanning behavior were observed at all times, which suggests that all cells are capable to explore their surroundings. Cell shape changes of migrating mesoderm. (a) Cell shape progression of nascent mesoderm delaminating at the primitive streak of a Mid Streak embryo (Z-projection of two-photon stack, scale bar: 10 μm). (b) Mesoderm cells extend filopodia (arrows) towards epiblast and visceral endoderm. Embryo is at Late Streak stage. (Z-projection of two-photon stack, scale bar: 10 μm). (b’) Quantification of filopodia per cell per time point as mean ± SEM, n=40 cells out of 4 Late Streak embryos for each, p<0.0001. P value was calculated using the t test. Data can be found in Figure 3—source data 1. (c) Montage of a mesoderm cell (from a Mid Streak stage embryo) displaying seeking behavior (Z-projection of two-photon stack, scale bar: 10 μm). 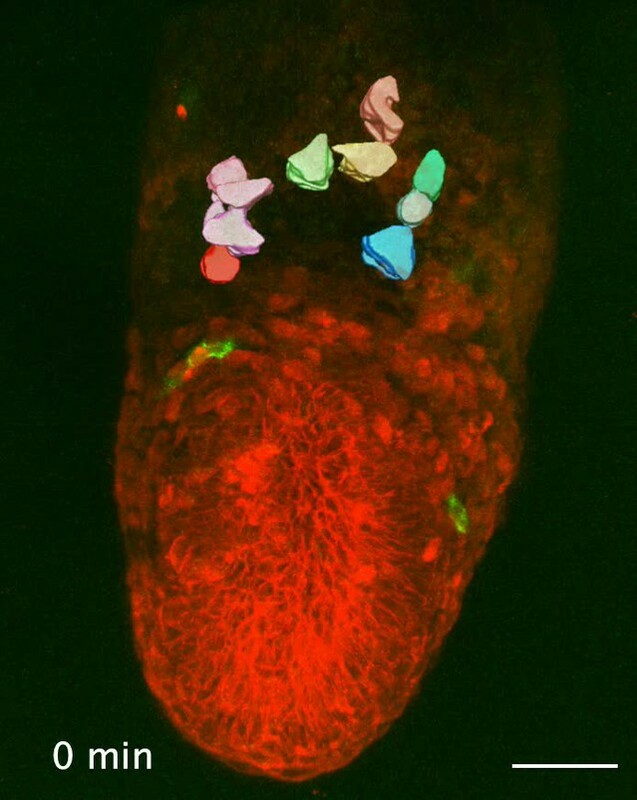 (d) Mesoderm cells are highlighted, through manual segmentation, in red, blue and yellow to track cell behavior after division (Z-projection of confocal stacks from a Mid Streak stage embryo, anterior view, scale bar: 50 μm). mG: membrane GFP, in green; mT: membrane dtTomato, in grey. 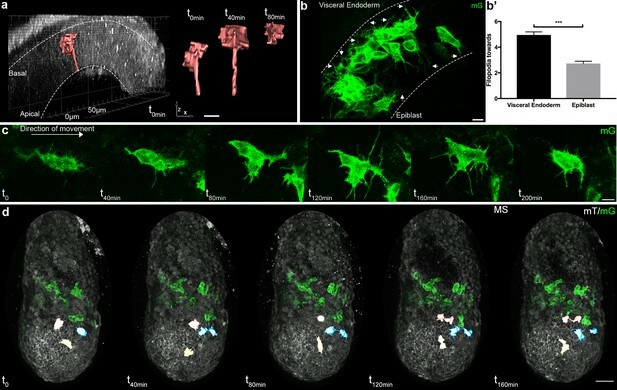 Mesoderm extends filopodia towards epiblast and visceral endoderm. Two-Photon stack of a T-Cre; mTmG embryo at Late Streak stage. The stack progresses from anterior to posterior. Mesoderm cells express membrane GFP (green); all other cells express membrane dtTomato (grey) (scale bar: 50 μm). Z-projection of two-photon stack from a T-Cre; mTmG embryo at Mid Streak stage imaged for 100 min. Arrow points at embryonic mesoderm cell. Mesoderm cells express membrane GFP (green); all other cells express membrane dtTomato (grey) (scale bar: 50 μm). To address the collectiveness of mesoderm migration, we assessed the impact of cell proximity on behavior by comparing the trajectories of daughter cells after mitosis, pairs of unrelated cells that were in immediate proximity at the beginning of observation, and cells colliding along the way. As expected from fate mapping experiments, daughter cells resulting from mitosis within the mesoderm layer followed close and parallel trajectories (Figure 3d and Figure 3—source data 2). They travelled a similar net distance over 204 min (net displacement ratio: 0.91 ± 0.01, n=12 pairs from four embryos at E/MS stage), in the same direction (angle: 7 ± 1.13°), with one daughter cell displaying a higher straightness (travel displacement ratio: 0.61 ± 0.07). They remained close to one another (mean distance between daughter cells: 15.6 ± 2.35 µm), but not directly apposed. Interestingly, they stayed linked by thin projections for hours, even when separated by other cells (Figure 3d). Pairs of cells that were in immediate proximity at time zero traveled a similar distance over 152 min (net displacement ratio: 0.88 ± 0.03, n=13 pairs from four embryos), in the same direction (angle: 9.9° ± 2.77); they remained close to one another (travel displacement ratio and final distance were respectively 0.75 ± 0.04 and 15.2 µm ± 3.84 µm) (Figure 3—source data 3). Contact between cell protrusions could be spotted in most pairs. Mesoderm cell migration is often compared to neural crest migration, as both cell types arise through epithelial-mesenchymal transition (Roycroft and Mayor, 2016). An important feature of neural crest migration is contact inhibition of locomotion, where cells that collide tend to move in opposite directions. In contrast, most mesoderm cells stayed in contact upon collision (Figure 3—source data 4): 16 out of 24 cell pairs from 5 ES to Zero Bud (0B) embryos remained attached for 2.5 hr (one briefly lost contact before re-joining), 3/24 stayed joined for around 1 hr, and 5/24 pairs separated instantly. We segmented 8 pairs for 166 min, and observed a mean distance at the end of tracking of 52.5 ± 32.5 µm; they followed parallel trajectories (angle: 8.25 ± 1.7°, n=8 pairs), for a similar net distance (net displacement ratio: 0.85 ± 0.07; travel displacement ratio: 0.64 ± 0.11). Thin projections could occasionally be observed between them after contact. Those data suggest that cells coming in close proximity tend to have a similar behavior. The presence of thin projections between them may reflect cell-to-cell communication. 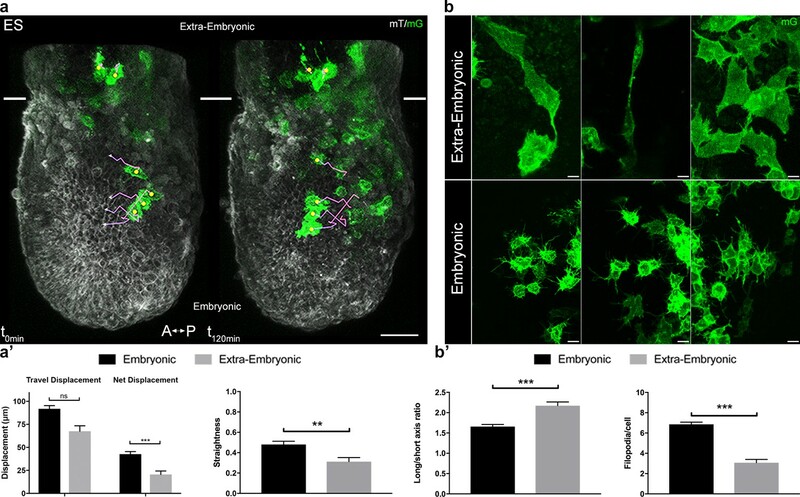 Embryonic and extra-embryonic mesoderm cells were isolated through fluorescence (GFP)-assisted cell sorting from E7.5 MS and LS T-Cre; mT/mG embryos in order to generate transcriptomes. Biological replicates (4 MS, 2 LS) from both stages resulted in grouping of samples according to the embryonic region (Figure 4a,b). Non-supervised clustering based on embryonic and extra-embryonic gene signatures identified by single cell sequencing in Scialdone et al. (2016) showed that samples segregated as expected (not shown). We performed pairwise comparison of embryonic and extra-embryonic samples obtained at both stages and selected the genes that were consistently differentially expressed with a fold change >2. Gene ontology analysis of genes clusters enriched either in embryonic or extra-embryonic mesoderm highlighted expected developmental (angiogenesis and hematopoiesis in extra-embryonic, somitogenesis in embryonic), and signaling (BMP and VEGF in extra-embryonic, Wnt and Notch in embryonic) biological processes (Figure 4—figure supplement 1a,a'). Interestingly, differences were also seen in gene clusters involved in migration, adhesion, cytoskeleton, and extracellular matrix organization. Transcriptomes of mesoderm populations identify differences between embryonic and extra-embryonic mesoderm. (a) t-Distributed Stochastic Neighbor Embedding (t-SNE) confirms grouping of similar biological samples at E7 (Mid Streak stage) and E7.25 (Late Streak stage). EM: Embryonic mesoderm; EEM: Extra-Embryonic mesoderm. More sample information can be found in Figure 4—source data 1. 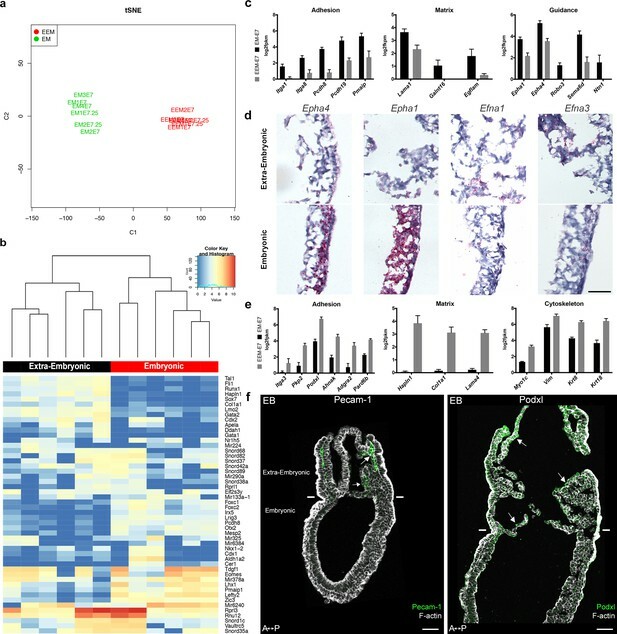 (b) Heat map showing differentially expressed genes between embryonic and extra-embryonic mesoderm with the highest statistical significance. (c, e) Selection of genes with higher expression in embryonic (c) or extra-embryonic (e) mesoderm, represented as mean ± SEM of log2 fpkm at E7 (n=4 biological replicates, p<0.01), with embryonic in black and extra-embryonic in grey. All represented genes are also significantly differentially regulated at E7.25. Data can be found in Figure 4—source data 2 and 3. (d) In situ hybridization of sagittal sections (anterior to the left) from Zero to Early Bud stages embryos highlighting transcripts for Epha4, Epha1, Efna1 and Efna3, represented by red dots, in the posterior region. Entire embryo sections are shown in Figure 4—figure supplement 1. (Scale bar: 100 μm) (f) Sagittal sections (anterior to the left) from Early Bud stage embryos stained for Platelet endothelial cell adhesion molecule 1 (left panel, Pecam-1 in green, Z-projection of confocal stack), Podocalyxin (right panel, Podxl in green, optical slice), and F-actin (Phalloidin, grey). See same section stained for mGFP in Figure 4—figure supplement 1. White lines mark the embryonic/extra-embryonic boundary. (Scale bars: 50 μm). Genes with known expression pattern in gastrulation embryos found enriched in embryonic mesoderm included well-described transcription factors, as well as FGF, Wnt, Notch, TGFβ and Retinoic Acid pathways effectors (Figure 4—figure supplement 1b). Genes expected to be more expressed in extra-embryonic mesoderm included the transcription factors Ets1 and Tbx20, and several members of the TGFβ pathway (Inman and Downs, 2007; Pereira et al., 2011) (Figure 4—figure supplement 1c). Primitive hematopoiesis, the initial wave of blood cell production which gives rise to primitive erythrocytes, macrophages, and megakaryocytes, takes place around E7.25 in hemogenic angioblasts of the blood islands (Lacaud and Kouskoff, 2017). Expression of genes involved in hemangioblast development, endothelium differentiation, and hematopoiesis increased from MS to LS (Figure 4f and Figure 4—figure supplement 1c). In addition, we confirmed two extra-embryonic genes identified through subtractive hybridization at E7.5 (Kingsley et al., 2001): Ahnak (Figure 4—figure supplement 1c), see also Downs et al. (2002) and the imprinted gene H19 (Figure 4—figure supplement 1c). Of particular interest among the genes with higher expression in embryonic mesoderm for which no expression data was available at the stage of development were genes related to matrix (Lama1, Galnt16, Egflam), adhesion (Itga1, Itga8, Pcdh8, Pcdh19, Pmaip1), and guidance (Epha1 and 4, Robo3, Sema6d, Ntn1) (Figure 4c). Epha4 expression in the mouse embryo has been described in the trunk mesoderm and developing hindbrain at Neural Plate (NP) stage (Nieto et al., 1992). In LS embryos, Epha4 expression was higher in the primitive streak and embryonic mesoderm (Figure 4d and Figure 4—figure supplement 1e). Dynamic Epha1, Efna1 and Efna3 expression patterns have been shown during gastrulation (Duffy et al., 2006). In LS/0B embryos, Epha1 mRNA was present in the primitive streak, mostly in its distal part. Its ligand Efna1 was in the primitive streak with an inverse gradient, and was mainly expressed in the extra-embryonic region, notably in amnion and in chorion. Efna3 was very abundant in the chorion (Figure 4d and Figure 4—figure supplement 1e). In parallel, in extra-embryonic mesoderm, we found higher expression of distinct sets of genes with putative roles in guidance (Unc5c, Dlk1, Scube2, Fzd4), matrix composition (Hapln1, Col1a1, Lama4), adhesion (Itga3, Pkp2, Podxl, Ahnak, Adgra2, Pard6b), Rho GTPase regulation (Rasip1, Stard8, Rhoj), and cytoskeleton (Myo1c, Vim, Krt8 and Krt18) (Figure 4e and not shown). Interestingly, Podocalyxin (Podxl) was abundant in extra-embryonic mesoderm (Figure 4f and Figure 4—figure supplement 1d), which fits with data from embryo and embryoid body single cell sequencing showing that Podxl is a marker for early extra-embryonic mesoderm and primitive erythroid progenitors of the yolk sac (Zhang et al., 2014). In view of the differences in cell shape and migration, we focused on the cytoskeleton, in particular actin, and intermediate filaments proteins (Vimentin and Keratins). Vimentin was found in all mesoderm cells as expected, but more abundant in extra-embryonic mesoderm (Figure 5a). Remarkably, within the mesoderm layer, Keratin 8 was selectively expressed in extra-embryonic mesoderm cells (amniochorionic fold, amnion, chorion, and developing allantois) (Figure 5b–d). In contrast, the filamentous actin (F-actin) network, visualized by Phalloidin staining, seemed denser in embryonic mesoderm (Figure 5a). To visualize F-actin only in mesoderm, we took advantage of a conditional mouse model expressing Lifeact-GFP, a peptide that binds specifically to F-actin with low affinity, and thus reports actin dynamics without disrupting them (Schachtner et al., 2012). Live imaging of T-Cre; LifeAct-GFP embryos at MS and LS stage confirmed that while LifeAct-GFP positive filaments could be visualized clearly in embryonic mesoderm cells, GFP was weaker and diffuse in extra-embryonic mesoderm (Figure 5e and Video 8). Embryonic and extra-embryonic mesoderm cells have distinct cytoskeleton composition. (a) Z-projections of confocal stack of a sagittal section from an Early Bud stage embryo stained for Vimentin, F-Actin (Phalloidin), and nuclei (DAPI). (b, d) Z-projections of confocal stacks of sagittal sections from Late Streak (b) and Early Bud (c: 20x, d: 40x) stages embryos stained for Keratin 8 (grey) and nuclei (DAPI, blue). (e) Z-projection of two-photon stack of a whole-mount T-Cre; LifeAct-GFP (green) Late Streak embryo. Anterior is to the left. (Scale bars: 50 μm). LifeAct-GFP expression is higher in embryonic mesoderm. 3D snapshots of two-photon stacks from a T-Cre; LifeAct-GFP embryo dissected at E7.25 (Late Streak stage) and imaged for 295 min. Images were processed with the ZEN blue denoise function. LifeAct-GFP (in green) highlights F-actin. The bright specks in extra-embryonic on the right side are debris. Lateral orientation with anterior to the left (3D scale bar: 50 μm). Z-projection of confocal stack of mesoderm explant from a T-Cre; mTmG embryo dissected at E7.5 (Late Streak stage). The explant was imaged for 750 min every 15 min. RhoaΔmesoderm explant undergoes compaction before cell migration. Z-projection of confocal stack of mesoderm explant from a T-Cre; mTmG; Rhoa fl/- embryo dissected at E7.5 (Late Streak stage). The explant was imaged for 750 min every 15 min. Rho GTPases are molecular switches that relay signals from cell surface receptors to intracellular effectors, leading to a change in cell behavior (Hodge and Ridley, 2016). They are major regulators of cytoskeletal rearrangements (Hall, 1998), and the spatiotemporal fine regulation of Rho GTPases activities determines cytoskeletal dynamics at the subcellular level (Spiering and Hodgson, 2011). Therefore, inactivation of a given Rho GTPase may result in variable consequences depending on cell type and context. We previously established that Sox2-Cre mediated deletion of Rac1 in the epiblast before onset of gastrulation causes impaired migration of embryonic mesoderm while extra-embryonic mesoderm migration is less severely affected (Migeotte et al., 2011). We thus hypothesized that Rho GTPases might be differentially regulated in cells invading both regions, resulting in some of the observed distinctions in cytoskeletal dynamics, cell shape and displacement mode. Mutations were induced in cells transiting the primitive streak by crossing heterozygous wild-type/null Rhoa (Jackson et al., 2011) or Rac1 (Walmsley et al., 2003) animals bearing the T-Cre transgene with animals homozygous for their respective conditional alleles bearing the mTmG reporter (mutant embryos are referred to as RhoaΔmesoderm and Rac1Δmesoderm). The phenotypes of RhoaΔmesoderm and Rac1Δmesoderm embryos were less severe than that of RhoaΔepi and Rac1Δepi embryos (our unpublished data and Migeotte et al., 2011) (Figure 6—figure supplement 1). Mutants were morphologically indistinguishable at E7.5. At E8.5, RhoaΔmesoderm embryos were identified, though with incomplete penetrance, as being slightly smaller than their wild-type littermates (11/12 mutants had a subtle phenotype, including five with reduced numbers of somites, and six with abnormal heart morphology) (Figure 6—figure supplement 1a). By E9.5, all RhoaΔmesoderm embryos had an obvious phenotype (12/12 mutants had a small heart, 9/12 had a reduced number of somites, 2/12 had an open neural tube, 2/12 had a non-fused allantois) (Figure 6—figure supplement 1b). Rac1Δmesoderm embryos also had subtle phenotypes at E8.5 (15/16 embryos were slightly smaller than wild-type littermates, 4/16 had a small heart) (Figure 6—figure supplement 1d). In situ hybridization for Brachyury showed weaker staining in the tail region in 5/10 mutant embryos, indicative of reduced presomitic mesoderm (Figure 6—figure supplement 1c). By E9.5, all mutants had abnormal heart morphology and reduced body length, and 3 embryos out of 9 were severely delayed (Figure 6—figure supplement 1e). At E10.5, penetrance was complete; 7/7 embryos had a short dysmorphic body and pericardial edema (not shown). The phenotypic variability at early time points likely reflects mosaicism of T-Cre mediated recombination. Rhoa and Rac1 mesoderm-specific mutants display impaired migration of embryonic mesoderm. (a) Z-projection and (b) frontal optical slice of wild-type (WT) and RhoaΔmesoderm embryos. Dashed lines mark the epiblast. (c) Z-projection and (d) sagittal optical slice of wild-type and Rac1Δmesoderm embryos highlighting the accumulation of mesoderm cells next to the primitive streak (*). Dashed lines mark the epiblast. (e) Z-projections of wild-type and RhoaΔmesoderm embryos (oblique anterior view, posterior to the right, two-photon) show impaired mesoderm migration in embryonic but not extra-embryonic regions. (f) Z-projections of wild-type and Rac1Δmesoderm embryos (anterior view, confocal) show impaired mesoderm migration in embryonic but not extra-embryonic regions. Each mutant is compared to a wild-type littermate in similar orientation. White lines mark the embryonic/extra-embryonic boundary. mG: membrane GFP, in green; mT: membrane dtTomato, in grey. (Scale bar: 50 μm). Embryonic mesoderm explants from E7.5 MS/LS mTmG; Rac1Δmesoderm or RhoaΔmesoderm embryos were plated on fibronectin. In wild-type explants, cells showed a radial outgrowth from the explants, displaying large lamellipodia in the direction of migration (Video 9). After cell-cell contact, they remained connected through long thin filaments. Rhoa deficient explants showed less release of individual cells (Figure 6—figure supplement 2a). 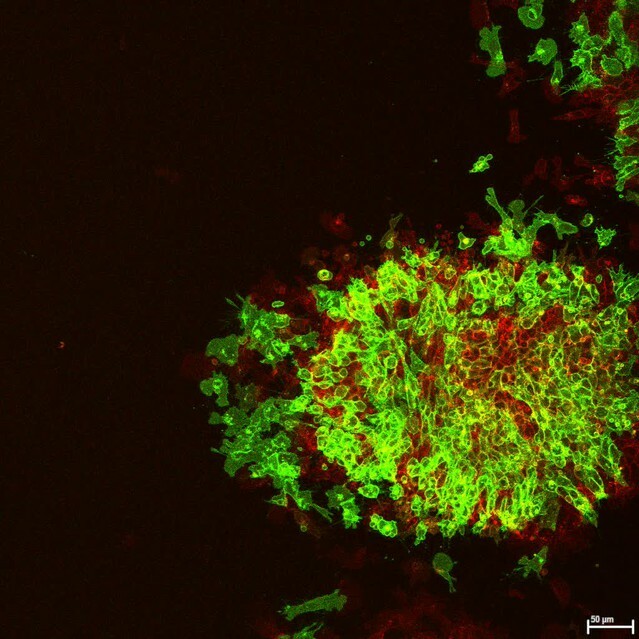 Rhoa mutant cells appeared more cohesive, and were rounder than wild-type cells (Figure 6—figure supplement 2c). Remarkably, live imaging of explants from Rhoa mutant embryos showed a phase of compaction preceding cell migration (Video 10; 2/4 RhoaΔmesoderm mutant explants displayed compaction). In Rac1 explants (Figure 6—figure supplement 2b), GFP-expressing cells remained within the domain of the dissected explant and displayed pycnotic nuclei, while wild-type non-GFP cells could migrate. Live imaging could not be performed as 4 out of 5 mutant explants detached from the plate. This is similar to explants from Rac1 epiblast-specific mutants (Migeotte et al., 2011), and is attributed to lack of adhesion-dependent survival signals. Live imaging of mTmG; RhoaΔmesoderm or Rac1Δmesoderm embryos dissected at E6.75 or 7.25 (Figure 6) showed that the majority of Rhoa and Rac1 mesoderm-specific mutants (4/8 for Rhoa, 6/9 for Rac1) displayed an accumulation of cells at the primitive streak, which formed a clump on the posterior side between epiblast and visceral endoderm (Figure 6a–d and Video 11), indicating a mesoderm migration defect. Interestingly, although embryonic mesoderm migration was impaired, with only a handful of cells visible on the anterior side by E7.5, extra-embryonic mesoderm migration was maintained (Figure 6e,f and Videos 12–15). There was a significant decrease in embryonic, but not extra-embryonic mesoderm cells speed for both Rhoa and Rac1 mutants, compared to wild-type embryos (Figure 6—figure supplement 1f). Similarly, in embryos deleted for Rac1 in epiblast and epiblast-derived cells upon Sox2-Cre (Hayashi et al., 2002) recombination, GFP positive mesoderm cells were dispersed in the extra-embryonic region, while embryonic mesoderm cells were confined in a bulge adjacent to the primitive streak (Figure 6—figure supplement 2d). Accordingly, staining for mesoderm-derived vascular structures (Pecam-1) in the yolk sac at E8.5 showed no difference between mutant and wild-type embryos (Figure 6—figure supplement 2e,f). Those findings suggest that extra-embryonic mesoderm cells either do not rely on Rac1 and Rhoa for movement, or are able to compensate for loss of Rac1 or Rhoa, which is consistent with their paucity in actin-rich protrusions. RhoaΔmesoderm embryos display an accumulation of mesoderm near the primitive streak. Two-photon Z stack of a T-Cre; mTmG; Rhoa fl/- embryo at Late Streak stage. Mesoderm cells express membrane GFP (green); all other cells express membrane dtTomato (grey). Anterior oblique orientation with anterior to the left (scale bar: 50 μm). Mesoderm migration tracking in RhoaΔmesoderm embryo. 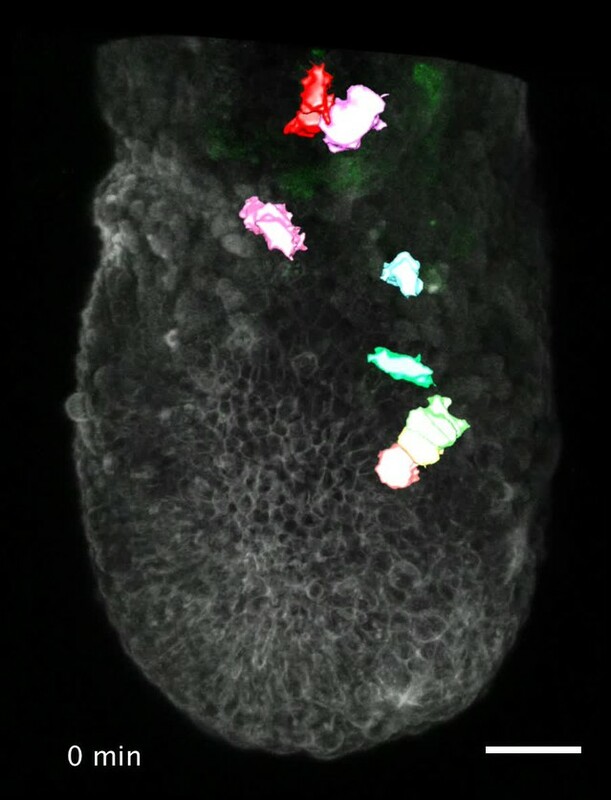 3D snapshots of stacks from a T-Cre; mTmG; Rhoa fl/- embryo dissected at E7.25 (Mid Streak stage) and imaged using two-photon microscopy for 120 min showing highlighted cells, which are tracked throughout the time lapse. 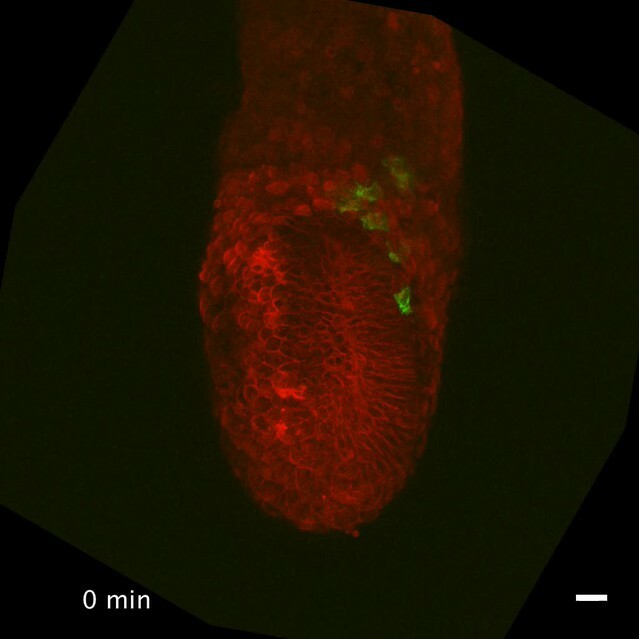 The video shows the highlighted cells first, then the original images (Membrane GFP, in green) in a looping fashion for comparison. All other cells express membrane dtTomato (grey). Anterior oblique orientation with anterior to the left (scale bar: 50 μm). Mesoderm migration tracking in RhoaΔmesodermembryo. 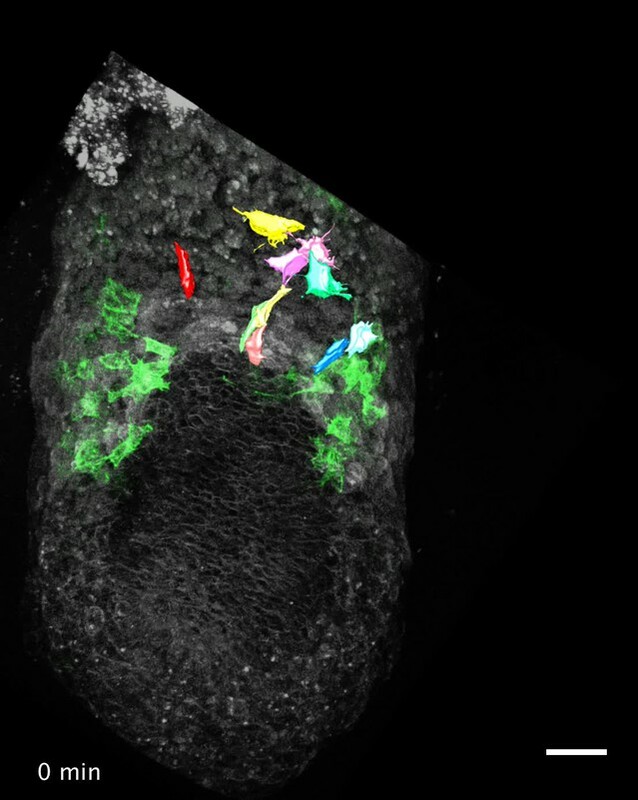 3D snapshots of stacks from a T-Cre; mTmG; Rhoa fl/- embryo dissected at E7.25 (Mid Streak stage) and imaged using two-photon microscopy for 100 min showing highlighted cells, which are tracked throughout the time lapse. 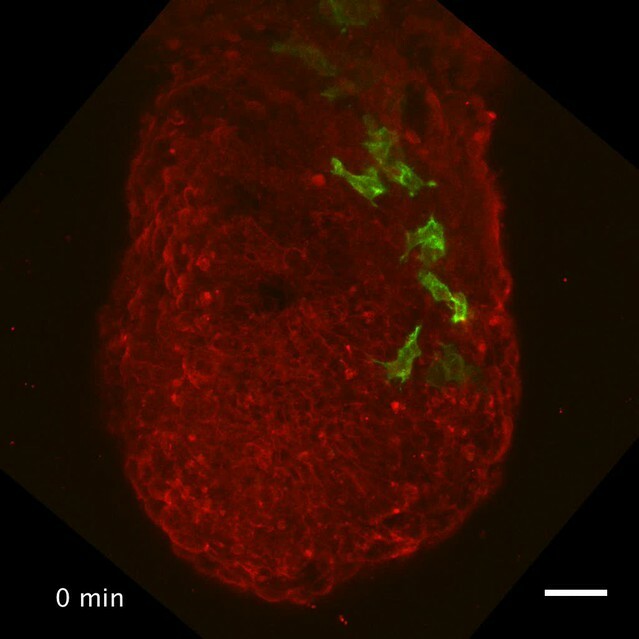 The video shows the highlighted cells first, then the original images (Membrane GFP, in green) in a looping fashion for comparison. All other cells express membrane dtTomato (grey). Anterior oblique orientation with anterior to the left (scale bar: 50 μm). Mesoderm migration tracking in Rac1Δmesoderm embryo. 3D snapshots of two-photon stack from a T-Cre; mTmG; Rac1 fl/- embryo dissected at E7.25 (Mid Streak stage) and imaged for 80 min showing highlighted cells, which are tracked throughout the time lapse. The video shows the highlighted cells first, then the original images (Membrane GFP, in green) in a looping fashion for comparison. All other cells express membrane dtTomato (grey). Lateral orientation with anterior to the left (scale bar: 50 μm). Mesoderm migration tracking in Rac1Δmesodermembryo. 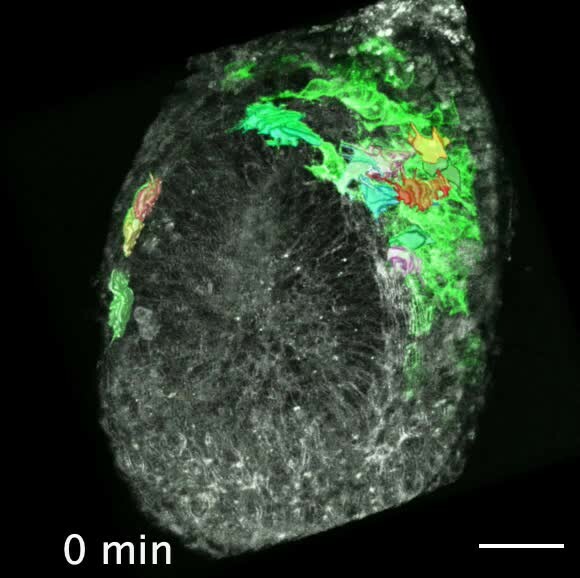 3D snapshots of confocal stacks from a T-Cre; mTmG; Rac1 fl/- embryo dissected at E6.75 (Early Streak stage) and imaged for 120 min showing highlighted cells, which are tracked throughout the time lapse. 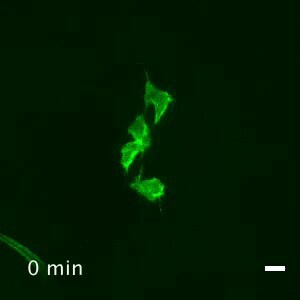 The video shows the highlighted cells first, then the original images (Membrane GFP, in green) in a looping fashion for comparison. All other cells express membrane dtTomato (red). Anterior orientation (scale bar: 50 μm). Mesoderm cell delamination from the epiblast requires basal membrane disruption, apical constriction, loss of apicobasal polarity, changes in intercellular adhesion, and acquisition of motility (Nieto et al., 2016). The transcriptional network and signaling pathways involved in epithelial-mesenchymal transition are conserved (Ramkumar and Anderson, 2011). However, pre-gastrulation embryo geometry varies widely between species, which has important consequences on interactions between germ layers and mechanical constrains on nascent mesoderm cells (Williams and Solnica-Krezel, 2017). Live imaging of mouse embryo has allowed recording posterior epiblast rearrangements, as well as cell passage through the primitive streak (Ramkumar et al., 2016; Williams et al., 2012). Contrary to the chick embryo, there is no global epiblast movement towards the primitive streak in the mouse. However, cell shape changes, including apical constriction and basal rounding, are similar. Morphological data on mouse mesoderm cells acquired through scanning electron microscopy of whole mount samples (Migeotte et al., 2011), and transmission electron microscopy of embryo sections (Spiegelman and Bennett, 1974) revealed an array of stellate individual cells linked by filopodia containing a lattice of microfilaments. We took advantage of mosaic labeling of nascent mesoderm to define the dynamics of cell shape changes associated with mesoderm migration. Cells just outside the streak retracted the long apical protrusion and adopted a round shape with numerous filopodia making contacts with adjacent, but also more distant mesoderm cells. In mesodermal wings, cells close to the epiblast were more loosely apposed, and extended fewer filopodia towards its basal membrane, compared to cells adjacent to the visceral endoderm, which were tightly packed and displayed numerous filopodia pointing to the visceral endoderm basal membrane. Cells travelling in a posterior to anterior direction towards the midline displayed long protrusions, up to twice the cell body size, which extended, retracted, occasionally bifurcated, several times before the cell body itself initiated movement, suggesting an explorative behavior. Remarkably, extension of long protrusions was not limited to the first row of cells. Migration was irregular in time and space, as cells often stopped and tumbled, and displayed meandrous trajectories. After division, cells remained attached by thin protrusions. Contrary to neural crest cells, mesoderm cells did not show contact inhibition of locomotion. Cells in close proximity tended to follow parallel paths. Extra-embryonic mesoderm first accumulates between extra-embryonic ectoderm and visceral endoderm at the posterior side of the embryo, leading to formation of the amniochorionic fold that bulges into the proamniotic cavity (Pereira et al., 2011). This fold expands, and lateral extensions converge at the midline. Accumulation and coalescence of lacunae between extra-embryonic mesoderm cells of the fold generate a large cavity closed distally by the amnion, and proximally by the chorion. At LS stage, extra-embryonic mesoderm forms the allantoic bud, precursor to the umbilical cord, in continuity with the primitive streak (Inman and Downs, 2007). Extra-embryonic mesoderm cells had striking differences in morphology and migration mode, compared to embryonic mesoderm cells. They were larger and more elongated, displayed fewer filopodia, and almost no large protrusions. They migrated at a similar speed, but in a much more tortuous fashion, resulting in little net displacement. Direction cues could come from cell-matrix contact, homotypic or heterotypic (with epiblast or visceral endoderm) cell-cell interaction, diffuse gradients of morphogens, and/or mechanical constraints. Transcriptome data were compatible with roles for guidance molecules such as Netrin1 and Eph receptors in directing mesoderm migration. Epha4 was strongly expressed in the PS and mesoderm, particularly in the embryonic region. In Xenopus, interaction of Epha4 in mesoderm and Efnb3 in ectoderm allows separating germ layers during gastrulation (Rohani et al., 2014). Epha1 and its ligands Efna1 and 3 had partially overlapping, but essentially reciprocal compartmentalized expression patterns during gastrulation (Duffy et al., 2006). In addition, we found abundant Epha1 expression in somites and presomitic mesoderm at E8.5 (not shown). Interestingly, Epha1 KO mice present a kinked tail (Duffy et al., 2008). The specific and dynamic expression patterns of Epha4, Epha1, and their respective ligands during gastrulation are compatible with roles in germ layers separation, including nascent mesoderm specification and migration. Identification of those potential guidance cues will help design strategies to better understand how mesoderm subpopulations reach their respective destinations. Visualization and modification of Rho GTPases activity through FRET sensors and photoactivable variants has shed light on their fundamental role during cell migration in in vivo contexts, such as migration of fish primordial germ cells (Kardash et al., 2010) or Drosophila border cells (Wang et al., 2010). Study of a epiblast-specific mutant showed that Rac1 acts upstream of the WAVE complex to promote branching of actin filaments, lamellipodia formation, and migration of nascent mesoderm (Migeotte et al., 2011). Remarkably, extra-embryonic mesoderm cells did not display leading edge protrusions, and Rac1 and Rhoa mesoderm-specific mutants were deficient for embryonic, but not extra-embryonic mesoderm migration. Interestingly, in embryos mutants for Fgfr1 (Yamaguchi et al., 1994) or Fgf8 (Sun et al., 1999), extra-embryonic mesoderm populations are almost normal, while embryonic mesoderm derivatives are severely affected. Measurement of Rho GTPases activity in those mutants would allow exploring the possibility that Rac1 and Rhoa act downstream of the FGF pathway to promote mesoderm migration, as proposed in Drosophila (van Impel et al., 2009). In addition, F-actin filaments were more abundant in embryonic, compared to extra-embryonic, mesoderm, reinforcing the hypothesis that they might rely on distinct cytoskeletal rearrangements. Intermediate filaments are major effectors of cell stiffness, cell-matrix and cell-cell adhesion, as well as individual and collective migration (Pan et al., 2013). Members of type I and II keratin families form obligate heterodimers, which assemble into filaments (Loschke et al., 2015). Type II Keratins 7 and 8, and type I Keratins 18 and 19 are the first to be expressed during embryogenesis. Combined Keratins 8/19 and 18/19 deletions cause lethality at E10 attributed to fragility of giant trophoblast cells (Hesse et al., 2000). Deletion of the entire type II Keratins cluster results in growth retardation starting at E8.5 (Vijayaraj et al., 2009). Recently, knockdown of Keratin 8 in frog mesendoderm highlighted a role for intermediate filaments in coordinating collectively migrating cells. Keratin-depleted cells were more contractile, displayed misdirected protrusions and large focal adhesions, and exerted higher traction stress (Sonavane et al., 2017). Transcripts for Keratins 8 and 18, as well as Vimentin, were enriched in extra-embryonic, compared to embryonic mesoderm. While Vimentin was present in all mesoderm, Keratin 8 was only detectable in extra-embryonic mesoderm. An antagonistic relationship between Vimentin intermediate filaments and Rac1-mediated lamellipodia formation has been described (Helfand et al., 2011), and a similar opposition may exist between Rac1 activity and keratin intermediate filaments (Weber et al., 2012). Extra-embryonic mesoderm cells' elongated morphology, paucity in lamellipodia, and lack of directional migration may thus result from their high content in intermediate filaments, and low Rho GTPase activity (Figure 7). The recent development of a K8-YFP reporter mouse strain for intermediate filaments (Schwarz et al., 2015), and the availability of reliable Rho GTPases FRET sensors (Spiering and Hodgson, 2011), will be instrumental in dissecting their relationship in mesoderm. Embryonic and extra-embryonic mesoderm cells show distinct shape, trajectory, Rho GTPases dependency, and cytoskeletal composition during gastrulation in the mouse embryo. In the extra-embryonic region (top), mesoderm cells are stretched, with higher Keratin 8 and Vimentin abundance. Their displacement is convoluted and does not depend on Rho GTPases. In the embryonic region (bottom), mesoderm cells are compact with numerous filopodia and have higher F-actin abundance. Cells have straighter trajectories and require Rho GTPases. The embryo scheme represents a sagittal section with anterior to the left. Green and grey label mesoderm and other layers, respectively. The mesoderm germ layer has the particularity to invade both embryonic and extra-embryonic parts of the conceptus, and its migration is important for both fetal morphogenesis and development of extra-embryonic tissues including the placenta. We found that embryonic and extra-embryonic mesoderm populations, both arising by epithelial-mesenchymal transition at the primitive streak, display distinct shape dynamics, migration modes, Rho GTPase dependency, cytoskeletal composition, as well as expression of different sets of guidance, adhesion, and matrix molecules. Landmark experiments in the 1990 s showed that the fate of a mesoderm cell depends on the time and place at which it emerges from the primitive streak. We have unveiled morphological and behavioral specificities of mesoderm populations through whole embryo live imaging, and provided a molecular framework to understand how cells with distinct fates adapt to, and probably modify, their tridimensional environment. The T-Cre line was obtained from Achim Gossler (Feller et al., 2008), the Rac1 line from Victor Tybulewicz (Walmsley et al., 2003), the Rhoa line from Cord Brakebusch (Jackson et al., 2011), the mTmG (Muzumdar et al., 2007) and Sox2-Cre (Hayashi et al., 2002) lines from The Jackson Laboratory, and the conditional LifeAct-GFP line from Laura Machesky (Schachtner et al., 2012). Mice were kept on a CD1 background. Mice colonies were maintained in a certified animal facility in accordance with European guidelines. Experiments were approved by the local ethics committee (CEBEA). Mouse genomic DNA was isolated from ear biopsies following overnight digestion at 55°C with 1.5% Proteinase K (Quiagen) diluted in Lysis reagent (DirectPCR, Viagen), followed by heat inactivation. Embryos were dissected in Dulbecco’s modified Eagles medium (DMEM) F-12 (Gibco) supplemented with 10% FBS and 1% Penicillin-Streptomycin and L-glutamine and 15 mM HEPES. They were then cultured in 50% DMEM-F12 with L-glutamine without phenol red, 50% rat serum (Janvier), at 37°C and 5% CO2. Embryos were observed in suspension in individual conical wells (Ibidi) to limit drift, under a Zeiss LSM 780 microscope equipped with C Achroplan 32x/0.85 and LD C Apochromat 40x/1.1 objectives. Stacks were acquired every 20 min with 3 μM Z intervals for up to 10 hr. Embryos were cultured for an additional 6 to 12 hr after imaging to check for fitness. Antibodies were goat anti-Pecam-1 1:500 (R and D systems); rabbit anti-Podocalyxin 1:200 (EMD Millipore); rat anti-Keratin 8 1:100 (Developmental Studies Hybridoma Bank); rabbit anti-Vimentin 1:200 (abcam). F-actin was visualized using 1.5 U/ml TRITC-Phalloidin (Invitrogen), and nuclei using DAPI (Sigma). Secondary antibodies were anti rabbit Alexa Fluor 488 and 647, anti rat Alexa Fluor 647 (all from Life technologies), and anti goat Alexa Fluor 647 (Jackson). Whole-mount in situ hybridization was carried out as described in Eggenschwiler and Anderson (2000). For in situ hybridization on sections, embryos were dissected in PBS and fixed for 30 min at 4°C in 4% PFA. They were washed in PBS, embedded directly in OCT (Tissue-Tek), and cryosectioned at 7–10 microns. Slides were re-fixed for 15 min on ice in 4% PFA. RNA probes were obtained from ACDBio, and hybridization was performed using the RNAscope 2.5 HD Reagent Kit-RED (ACDBio) according to manufacturer’s instructions. Slides were counterstained with 50% Gill’s Hematoxylin. For immunofluorescence, embryos were fixed in PBS containing 4% paraformaldehyde (PFA) for 2 hr at 4°C, cryopreserved in 30% sucrose, embedded in OCT and cryosectioned at 7–10 microns. Staining was performed in PBS containing 0.5% Triton X-100% and 1% heat-inactivated horse serum. Sections and whole-mount embryos were imaged on a Zeiss LSM 780 microscope. Primary explant cultures of nascent mesoderm were generated as described in Burdsal et al. (1993). Explants were cultured for 24–48 hr in DMEM F-12 supplemented with 10% FBS and 1% Penicillin-Streptomycin and L-glutamine on fibronectin (Sigma) coated glass bottom microwell 35 mm dishes with 1.5 cover glass (MatTek). They were fixed for 30 min in PBS containing 4% PFA prior to staining. For live imaging, explants were let to adhere for 4–6 hr, and then imaged every 15 min for up to 12 hr. Images were processed using Arivis Vision4D v2.12.3 (Arivis, Germany). Embryo contours were segmented manually on each Z-slice and time point, and then registered using the drift correction tool of Arivis Vision4D. Embryo rotation was adjusted manually if necessary. We chose embryos where successful registration could be achieved, so that the embryo's residual slight movements were much smaller than cell displacement. Similarly, we found embryo growth to be negligible compared to cell displacement (data not shown). Cells were then manually segmented on each Z-slice and time point by highlighting cellular membranes using Wacom’s Cintiq 13HD. Net displacement, path length, speed and angle between two cells were based on the centroid coordinates of segmented cells from Arivis, and calculated by a homemade Python script (Python Software Foundation, https://www.python.org). To extract speed behavior, we interpolated the path length curve and derivated it. The path length over time was closely linear, so we extracted the mean of the speed values. Surface, volume, long/short axis ratio of 2D inner ellipse, and straightness were calculated by Arivis. 2D Z projections of late embryos were used to quantify the filopodia length and density. Filopodia size and density were measured on Icy (de Chaumont et al., 2012) and analyzed using a homemade Python script. Videos were generated using the StackReg ImageJ plugin (Thévenaz et al., 1998). All data are presented as Mean ± SEM. Depending on whether data had a Gaussian distribution or not, we used either the Mann-Whitney-Wilcoxon or the t-test. A p value < 0.05 was considered statistically significant. T-Cre; mTmG embryos were collected from different mice, and those at the appropriate stage were pooled. Embryonic and extra-embryonic portions were separated by manually cutting the embryo with finely sharpened forceps. The embryos were digested using 2X Trypsin, and pure GFP + populations were sorted through flow cytometry (FACSARIA III, BD), directly in extraction buffer. RNA was extracted using the PicoPure kit (ThermoFisher Scientific). RNA quality was checked using a Bioanalyzer 2100 (Agilent technologies). Indexed cDNA libraries were obtained using the Ovation Solo RNA-Seq System (NuGen) following manufacturer recommendation. The multiplexed libraries (18 pM) were loaded on flow cells and sequences were produced using a HiSeq PE Cluster Kit v4 and TruSeq SBS Kit v3-HS from a Hiseq 1500 (Illumina). Paired-end reads were mapped against the mouse reference genome (GRCm38.p4/mm10) using STAR software to generate read alignments for each sample. Annotations Mus_musculus.GRCm38.87.gtf were obtained from ftp.Ensembl.org. For transcript quantification, all the Reference Sequence (RefSeq) transcript annotations were retrieved from the UCSC genome browser database (mm10). Transcripts were quantified using the featureCounts (Liao et al., 2014) software tool using the UCSC RefSeq gene annotations (exons only, gene as meta features). Normalized expression levels were estimated using the EdgeR rpm function and converted to log2 FPKM (fragments per kilobase of exon per million mapped reads) after resetting low FPKMs to one to remove background effect. Differential analysis was performed using the edgeR method (quasi-likelihood tests) (McCarthy et al., 2012). The edgeR model was constructed using a double pairwise comparison between embryonic mesoderm versus extra-embryonic mesoderm at two different time points (MS and LS). First, the count data were fitted to a quasi-likelihood negative binomial generalized log-linear model using the R glmQLFit method. To identify differentially expressed genes, null hypothesis EM_E7.0==EEM_E7.0 and EM_E7.25==EEM_E7.25 were tested using the empirical Bayes quasi-likelihood F-tests (glmQLFTest method) applied to the fitted data. The F-test P-values were then corrected for multi-testing using the Benjamini-Hochberg p-value adjustment method. Transcripts with a greater than background level of expression (mean log2 count per million >0), an absolute fold change >2, and a low false discovery rate (FDR <0.05) were considered as differentially expressed. The sample visualization map was produced by applying the t-Distributed Stochastic Neighbor Embedding (tSNE) dimensionality reduction method (Van Der Maaten and Hinton, 2008) to log2 FPKM expression levels (all transcripts). The R tSNE method from 'Rtsne' library was applied without performing the initial PCA reduction and by setting the perplexity parameter to 2. The heatmap was produced using the R heatmap.2 methods using the brewer.pal color palette. GO analysis was performed using the DAVID software (Huang et al., 2009). Cell Adhesion & Migration 6:397–403. Nature Reviews Molecular Cell Biology 17:496–510. Molecular Biology of the Cell 22:593–605. Development, Growth and Differentiation 43:133–143. Current Opinion in Cell Biology 32:56–64. Current Opinion in Cell Biology 25:47–56. Cellular and Molecular Life Sciences 73:1119–1130. European Journal of Cell Biology 91:923–929. Journal of Embryology and Experimental Morphology 32:723–728. Cell Adhesion & Migration 5:170–180. Seminars in Cell & Developmental Biology 55:89–98. IEEE Transactions on Image Processing 7:27–41. Journal of Experimental Zoology 261:40–61. The Journal of Cell Biology 187:175–184. Philosophical Transactions of the Royal Society B: Biological Sciences 369:20130547. Current Opinion in Cell Biology 48:33–39. Thank you for submitting your article "Distinct mesoderm migration phenotypes in extra-embryonic and embryonic regions of the early mouse embryo" for consideration by eLife. Your article has been reviewed by three peer reviewers, including Lilianna Solnica-Krezel as the Reviewing Editor and Reviewer #1, and the evaluation has been overseen by Jonathan Cooper as the Senior Editor. The following individual involved in review of your submission has agreed to reveal their identity: Margot Williams (Reviewer #3). Using beautiful in vivo imaging, the manuscript describes migratory behaviors of individual internalized embryonic and extraembryonic mesoderm cells in gastrulating mouse embryo, and reveals differences between them. The differences in migration, cell shape, actin organization and protrusive activities between embryonic and extra-embryonic mesoderm (ExM) are correlated with RNA-seq dataset that reveals interesting differences in gene expression. The authors first provide evidence of reduced speed, displacement, and straightness of ExM migration compared with embryonic mesoderm (EM), and correlate these with quantitative and qualitative differences in cell shape and number and type of cellular protrusions produced. They then profile gene expression in purified ExM and EM populations to identify possible molecular regulators of the distinct cell behaviors they identified. Differentially expressed genes include those with potential roles in cell migration, including adhesion, extracellular matrix, guidance, and cytoskeleton genes. Notably, genes associated with the actin cytoskeleton tend to be reduced in ExM, while those encoding intermediate filaments are increased in ExM. In light of the observed differences between cytoskeleton and migratory behavior between ExM and EM, the authors evaluate the role of Rho GTPases RhoA and Rac1 in mesoderm migration by conditional loss-of-function in cells traversing the primitive streak. They find that migration of ExM is less affected than EM by loss of both GTPases, demonstrating distinct molecular regulation of these two mesoderm populations. Based on these functional studies, the authors argue that embryonic but not extra-embryonic mesoderm depends on Rho GTPases, indicating reliance on distinct cytoskeletal rearrangements. It has long been recognized that genetic regulation of ExM migration is distinct from that of embryonic mesoderm, but the cellular and molecular basis of this distinction was largely unknown. This is an interesting, concise and carefully conducted study that sheds light on this issue. The descriptive aspects of the manuscript are novel and should be of interest to eLife readership. The RNA-seq data set, in particular for the ExM, provides valuable data for future analyses and intra as well as inter-species comparisons, especially now when aspects of mouse and human gastrulation are studied in synthetic in vitro scenarios. For these reasons, the reviewers feel this work makes important advances in our understanding of gastrulation morphogenesis. However, there are some missed opportunities that could have provided exciting data regarding the relationship between mesodermal cells and surrounding tissues, in particular, the visceral endoderm. There are additional issues (listed below) that the authors should address before this report is published. 1) It has been shown that the proximal third of the visceral endoderm cells overlying the epiblast in the posterior region remain relatively coherent forming a crescent that tapers anteriorly (Kwon et al., 2008). This region has been proposed by Kwon and co-workers to be a signaling center. This area of visceral endoderm appears to overlay the area of spread of embryonic mesodermal cells in the proximal posterior side of the embryo. Is there a relationship between the movements of posterior mesoderm and posterior visceral endoderm? This issue should be at least discussed by the authors, if addressing it experimentally would extend the revision beyond 2 months. 2) Kwon et al. (2008) also argued that distal visceral endoderm cells intercalate with definitive endoderm cells. Was this phenomenon evident in the authors' experiments? 3) The laboratory of Karen Downs has argued that posterior visceral endoderm cells located in the extra-embryonic region exfoliate and contribute to extra-embryonic mesoderm derivatives like the allantois (Rodriguez and Downs, 2017). Was this phenomenon observed in the present studies? Are GTPases not required for extraembryonic mesoderm migration, or simply are there different genetic redundancies between the two cell types? There should be at least some discussion regarding upstream regulators of Rho/Rac1 in embryonic mesoderm. 4) Several figures contain graphs depicting the number of filopodia per cell. Is this filopodia per unit time? Or at a single time point? It just seems unrealistic that a mesoderm cell would produce only 7 filopodia over the course of several hours of imaging. This could be the result of the imaging interval, though. Cell protrusions are extremely dynamic, and one stack every 20 minutes likely does not provide sufficient temporal resolution required for this type of quantification. Could the authors please clarify how such measurements were made? 5) In gene expression profiling experiments, EM and ExM samples are compared to "non-mesoderm controls" – what types of tissues are these? And why do they cluster with embryonic mesoderm but not the ExM? 6) When describing the results of these profiling experiments, the authors discuss the enrichment of certain GO terms and gene clusters among differentially expressed genes, but it is not clear whether genes associated with these terms/clusters exhibit increased or decreased expression in ExM vs. EM. This is even the case in Figure 4—figure supplement 1A, where the p value of each enriched term is presented, but no information is given about which is increased or decreased in ExM or EM. 7) A major conclusion of this report is that "extra-embryonic mesoderm movement was… GTPase dependent". However, no quantification is provided in support of this critical finding. Although ExM cells can be seen in the extra-embryonic region of RhoA and Rac1; T-cre conditional KO embryos, it was not determined whether the number of these cells is comparable to control embryos, and whether they exhibit similar dynamics during migration. The authors have demonstrated their ability to quantify size and number of protrusions, migration speed, persistence etc. of migrating mesoderm cells. Cell trajectories and migration speed of ExM cells should be analyzed for Rac1 and RhoA mutant ExM cells and compared to wild type, as done in Table 1. 8) The T(s)-Cre transgenic line was used to drive cre expression in the primitive streak. In this line, cre expression is driven by the Brachyury (T) promoter. T, however, is also expressed in extra-embryonic ectoderm (Rivera-Perez and Magnuson, 2005; Perea-Gomez et al., 2004). I assume that in T(s)-cre embryos, cre is not expressed in the extra-embryonic ectoderm. If this is the case, the authors need to stress that the transgene is only expressed in the primitive streak. Also, please stress that it is a random insertion transgenic line not a knock-in line into the T locus that inactivates T.
9) "Posterior views (Figure 1A) showed proximal to distal primitive streak extension and rounding of cells exiting the streak". Epiblast cells are elongated in apical-basal direction. In this image, indeed shapes of the cells in the midline appear round. It is not clear however, whether this represents a cross-section of elongated cells or a true round shape in 3D. Additional images or information should be provided to support this conclusion. In addition, is this confirming earlier observations or a novel observations of the authors? 10) "Extra-embryonic cells were stretched, sometimes spanning the entire widths of the embryo, and twice larger". Could the authors comment on their third dimension? Were they flatter compared to embryonic cells? It is also striking that these extraembryonic cells have twice the volume of embryonic mesodermal cells (Table 2). What is the reason for this difference? Are the precursors in the primitive streak different? Or fewer cell divisions in the extra-embryonic population? 11) In general, the manuscript would be improved by clearly stating the questions motivating individual lines of experiments and providing conclusions. For example, the title of this section is "Cell-cell communication within the mesodermal layer", yet no question is posed. The results describe relative migratory behaviors of daughter cells in mesodermal cell layer. In the second part of this section the behavior of mesodermal cells upon contact that usually not result in contact inhibition is contrasted to that previously reported for neural crest cells. One concern about this section is why it is titled "cell-cell communication" as there is no direct evidence for communication between cells apart from cells migrating "in the same direction, remaining close to one another, and staying linked by thin projections." Second, the behavior of daughter cells and cells close to one another at the beginning of a time-lapse should be compared. Is the described behavior of two daughter cells unusual or is it typical for two cells that happen to be close to one another? Finally, there is no conclusion at the end of the section. 12) The findings on the migratory cell behaviors of mesodermal cells should be also better presented in the context of gastrulation studies in other systems and the work in the mouse. Whereas the authors emphasize collective cell behaviors in Drosophila and other vertebrates, meandering migration of mesodermal cells was documented in the Fundulus fish by pioneering studies of John Trinkaus and in zebrafish by studies from Solnica-Krezel laboratory, as well as in the chick embryo by studies from Weijer laboratory. In particular the meandering directed migration of individual mesodermal cells with protrusive activity is highly similar to that described by Jessen et al., 2002 in the zebrafish gastrula. 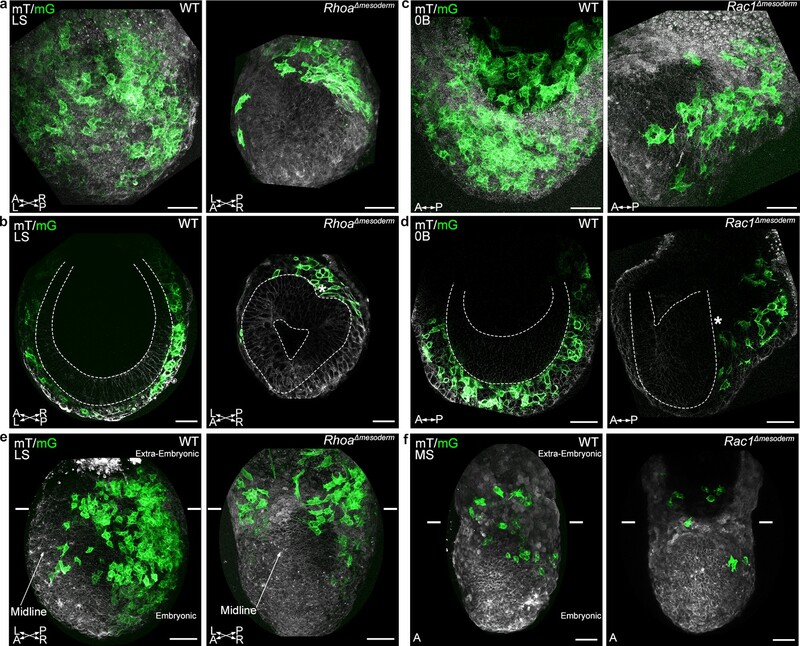 Therefore, Migeotte and colleagues demonstrate that in mouse embryo, mesoderm gastrulation movements entail directed migration on embryonic mesodermal cells in addition to the well described intercalation movements of axial mesoderm. A) Embryonic mesoderm fails to migrate away from the PS in FGF8 and FGFR1 mutant mouse embryos, but extraembryonic mesoderm can migrate away (Yamaguchi et al., 1994; Sun et al., 1999). B) Mutations affecting BMP signaling, including BMP4, Pace/Furin, and BMP receptors prevent formation of an embryonic primitive streak, but allow for production of some extraembryonic mesoderm (Gu et al., 1999; Song et al., 1999; Beck et al., 2002; Winnier et al., 1995). Also, the authors note on the presence of tumbling behavior alternating with straighter displacement, which is strikingly similar to "tumble and run" movements described in zebrafish embryos (Diz-Munoz et al., 2016). This similarity is worth noting and citing. Perea-Gomez A, Camus A, Moreau A, Grieve K, Moneron G, Dubois A, Cibert C, Collignon J. Initiation of gastrulation in the mouse embryo is preceded by an apparent shift in the orientation of the anterior-posterior axis. Curr Biol. 2004 Feb 3;14(3):197-207. Rivera-Pérez JA, Magnuson T. Primitive streak formation in mice is preceded by localized activation of Brachyury and Wnt3. Dev Biol. 2005 Dec 15;288(2):363-71. Rodriguez AM, Downs KM. Visceral endoderm and the primitive streak interact to build the fetal-placental interface of the mouse gastrula. Dev Biol. 2017 Dec 1;432(1):98-124. doi: 10.1016/j.ydbio.2017.08.026. Thank you for resubmitting your work entitled "Distinct mesoderm migration phenotypes in extra-embryonic and embryonic regions of the early mouse embryo" for further consideration at eLife. Your revised article has been favorably evaluated by Jonathan Cooper as the Senior Editor and a Reviewing Editor. As suggested by the reviewers, the authors analyzed movements of pairs of neighboring cells (subsection “Impact of cell-cell contact on trajectory within the mesoderm layer”, third paragraph). To make clear the difference between this scenario and the scenario of two daughter cells that migrated in concert, would it be correct to state "Pairs of unrelated cells that were in immediate proximity"? Also have the authors observed any projections linking such cells as they observed for daughter pairs (see the second paragraph of the aforementioned subsection)? This is stated later in the concluding sentence, but should be stated here. Moreover, the observation that unrelated cells can also follow parallel paths should be included in the third paragraph of the Discussion. Please indicate developmental stages on the figure panels. Subsection “Extra-embryonic mesoderm migration is Rho GTPases independent”, third paragraph: "…live imaging of Rhoa deleted explants" rather "live imaging of explants from Rhoa mutant gastrulae or embryos". Visceral endoderm cells are marked with membrane Tomato. 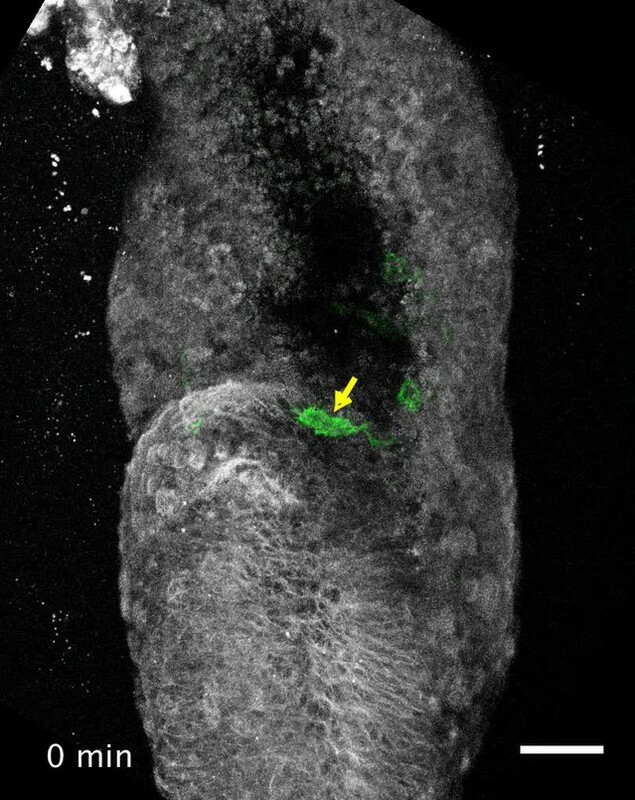 We designed the condition of two-photon live imaging in order to get an optimal GFP signal, and just enough Tomato to get the anatomy of the embryo, to reduce phototoxicity. Due to the relatively weak Tomato signal and the morphology of the posterior visceral endoderm cells, which tend to be rather flat, we were not able to reliably track visceral endoderm cells movements. We added a reference to the potential signaling function of the posterior visceral endoderm proposed by Kwon et al. (subsection “Mesoderm cells have distinct morphology depending on their interaction with different germ layers”). Cells crossing the streak to become definitive endoderm do not appear to express Cre, as we very rarely observed GFP positive cells in the endoderm layer, even when looking at later time points (E7.75). The transgenic T(s)::Cre line was engineered using a construct composed of regulatory elements of the Brachyury gene directing gene expression in the primitive streak fused to a Cre cDNA. It does not recapitulate all aspects of endogenous T expression. This observation fits with the characterization of the line published in Feller et al., 2008: in Figure 1—figure supplement 1A, a T(s)::Cre; Rosa26-LacZ embryo at head fold stage has no visible blue cells in the endoderm. Alternatively, Burtscher and Lickert (2009) described anti-parallel gradients of FoxA2 and T along the streak, so it is possible that T might not label endoderm progenitors, just midline and mesoderm. We have not done the experiment to distinguish those two possibilities. We clarified the design of the T-Cre transgenic line (subsection “Mesoderm migration mode and cell shape differ in embryonic versus extra-embryonic regions”, first paragraph), stated that we did not visualize definitive endoderm, and proposed explanations (subsection “Mesoderm cells have distinct morphology depending on their interaction with different germ layers”). As mentioned above, Tomato expressing cells could not be visualized with as much clarity, which rendered their tracking unreliable. In addition, experiments suggesting delamination of posterior visceral endoderm cells to become extra-embryonic mesoderm were mostly conducted from the Zero Bud stage onwards, while most of our recordings were performed between Early Streak and Zero Bud stages, so we would not have been in the best position to observe this phenomenon. Indeed, our data cannot differentiate between absence of dependency on RhoGTPases, and different redundancy. We have corrected this in the manuscript (subsection “Extra-embryonic mesoderm migration is Rho GTPases independent”, last paragraph). We have also proposed that RhoGTPases might be downstream of Fgf signaling (Discussion, sixth paragraph). This was indeed confusing. It is "filopodia per cell per time point". It has been clarified in the legends. The non-mesoderm controls contain a mixture of all non-GFP cells, which include extra-embryonic ectoderm, epiblast, visceral endoderm, and probably some non-labeled mesoderm cells. We did not analyze those data in detail, as results were quite heterogeneous between samples, likely due to unequal proportions of cells from each population in different samples, as we did not collect all non-GFP cells from each pool of embryos. Embryonic controls tend to be closer to embryonic mesoderm indeed, probably because the majority of the cells are likely to be of epiblast origin. Since data from those samples were not discussed, we eliminated them from the tSNE plot and Table 3. GO had been performed based on the list of differentially regulated genes, whichever the direction. The QLF list has now been divided in two according to the region of higher expression, and GO has been performed based on those two lists. This analysis is displayed in Figure 4—figure supplement 1A, and describe in the text (subsection “Embryonic and extra-embryonic mesoderm molecular signatures”, first paragraph). In order to consolidate the data pointing to the difference of dependency on GTPases, we have added quantitative analysis of the live imaging data. The number of GFP positive cells at the early stages of gastrulation, when tracking of cells shape and speed could be done with precision, was quite variable among wild-type embryos, which we attribute to the mosaicism of T-Cre expression. Comparing cell numbers between wild-type and mutant embryos was thus not practical. We could however segment cells in mutant embryos, and record quantitative data on cell shape and movements. We segmented mesoderm cells in the embryonic and extra-embryonic regions of mutants. It was difficult to perfectly register mutant embryos due to their irregular shape. Because of the relatively low number of cells available, we tracked them for as long as possible, which resulted in different times of observation. Therefore, we could not directly compare net and travel displacements. We could nonetheless observe a significant decrease in embryonic, but not extra-embryonic mesoderm cells speed for both Rho and Rac mutants, compared to wild-type embryos. The data has been added to Figure 6—figure supplement 1 (Figure 6—figure supplement 1—source data 1 and 2), and is described in the manuscript (subsection “Extra-embryonic mesoderm migration is Rho GTPases independent”, last paragraph). In addition, we performed live imaging of a Rac1fl/ko; mTmG; Sox2-Cre embryo, and confirmed the presence of GFP positive extra-embryonic mesoderm cells dispersed in the extra-embryonic region, while GFP positive mesoderm cells were confined in a bulge adjacent to the primitive streak in the embryonic region (subsection “Extra-embryonic mesoderm migration is Rho GTPases independent”, last paragraph). Those images have been added to Figure 6—figure supplement 2. Please refer to response to point 2. We have examined mTmG; T-cre embryos between E6.25 and E6.5, and have not identified any GFP positive cells in the extra-embryonic ectoderm. It represents a cross-section of bottle shape cells in their round portion. This confirms earlier observation, in particular those of Williams et al. It has been made clear in the text (subsection “Mesoderm migration mode and cell shape differ in embryonic versus extra-embryonic regions”, second paragraph). 10) "Extra-embryonic cells were stretched, sometimes spanning the entire widths of the embryo, and twice larger". Could the authors comment on their third dimension? Were they flatter compared to embryonic cells? It is also striking that these extraembryonic cells have twice the volume of embryonic mesodermal cells (Table 2). What is the reason for this difference? Are the precursors in the primitive streak different? Or fewer cell divisions in the extra-embryonic population? Extra-embryonic cells were larger and more elongated. The increase in volume was larger than the increase in surface, which indicates they were not flatter. We quantified cell divisions in time-lapse recordings. Embryonic and extra-embryonic mesoderm cells were observed over an average of 360 min from 4 different embryos at Mid Streak stage and division events were recorded. Cells migrating close to embryonic/extra-embryonic interface were not taken into consideration to avoid misallocation. Division events counts were normalized over total number of GFP positive cells per region. We found indeed a higher frequency of division in embryonic, compared to extra-embryonic mesoderm. This data has been added to the text (subsection “Mesoderm migration mode and cell shape differ in embryonic versus extra-embryonic regions”, fourth paragraph) and is shown in Figure 1—figure supplement 1 (Figure 1—figure supplement 1—source data 1). We have modified the subsection title (“Impact of cell-cell contact on trajectory within the mesoderm layer”), and added an introduction and conclusion to the paragraph. Pairs of cells in immediate close proximity were segmented and tracked. In the embryonic region, paired mesoderm cells traveled a similar distance over 152 min (net displacement ratio: 0.88 ± 0.03, n=13 pairs from 4 embryos), in the same direction (angle: 9.9° ± 2.77). Travel displacement ratio and final distance between paired cells were 0.75 ± 0.04 and 15.2 µm ± 3.84 µm, respectively (Figure 3—source data 3). All values were similar to what was observed for daughter cells displacements, so indeed the behavior of daughter cells resembles that of two cells that happen to be close to one another. This data is included in the third paragraph of the subsection “Impact of cell-cell contact on trajectory within the mesoderm layer”. References to the work of John Trinkaus as well as Jessen et al. have been added in the Introduction, and more details were given regarding the work of the Weijer lab (Introduction, third paragraph). A. Embryonic mesoderm fails to migrate away from the PS in FGF8 and FGFR1 mutant mouse embryos, but extraembryonic mesoderm can migrate away (Yamaguchi et al., 1994; Sun et al., 1999). The phenotypes are indeed strikingly similar and should have been referred to. We corrected this in the Discussion (Discussion, sixth paragraph). B. Mutations affecting BMP signaling, including BMP4, Pace/Furin, and BMP receptors prevent formation of an embryonic primitive streak, but allow for production of some extraembryonic mesoderm (Gu et al., 1999; Song et al., 1999; Beck et al., 2002; Winnier et al. 1995). In the ActRIA mutant (Gu et al., 1999), there is no primitive streak, and some mesenchymal cells in the extra-embryonic region (identified by morphology, not markers). In the double ActRIIA/IIB mutant there is no streak and no mesoderm, and in the IIA-/-IIb+/- there is some mesoderm in both region (Song et al., 1999). In the BMP4 KO (Winnier et al., 1995), there is also no streak, and some small amount of extra-embryonic mesoderm (also identified by morphology). We are afraid the comparison might be confusing here, as due to absence of the primitive streak the phenomenon is likely to differ. The extra-embryonic mesoderm cells observed could arise from another layer (cf. Rodriguez and Downs, 2017). Furin/Pace 4 double mutants are reduced in size at E7.5, there is no amnion, allantois or chorion, and some mesoderm expressing FgF8 and Lhx1 bulges into the cavity, but markers of extra-embryonic mesoderm are not shown (Beck et al., 2002). Therefore we would rather not include those references. Reference to the work of Diz-Munoz et al. has been added (subsection “Mesoderm migration mode and cell shape differ in embryonic versus extra-embryonic regions”, third paragraph). The proposed change in terminology for cells in proximity has been made (subsection “Impact of cell-cell contact on trajectory within the mesoderm layer”, first paragraph). In two-photon videos, we could indeed observe contact between protrusions from cells close to one another. Some of the analyzed pairs are from confocal videos with lesser resolution; for those we cannot say for sure. Nonetheless, we could observe points of contact for 10/12 pairs and have thus included a sentence in that direction (subsection “Impact of cell-cell contact on trajectory within the mesoderm layer”, third paragraph). A sentence has been included in the Discussion (third paragraph). This has been done in all figures. In view of their abnormal development, no stage was indicated for mutant embryos; however, the stage of the wild-type littermate displayed in each panel was noted. We thank the animal house, FACS, and light microscopy (LiMiF) core facilities at the ULB (Erasme Campus), and the Brussels Interuniversity Genomics High Throughput core (www.brightcore.be). We thank M Martens and J-M Vanderwinden for confocal imaging help, A Lefort and F Libert for RNA sequencing help, C Brakebusch, A Gossler, V Tybulewicz, and L Machesky for kindly sharing mouse lines, and A Zwijsen, J Bloomekatz, and E Urizar for constructive comments on the manuscript. BS has been sequentially supported by a fellowship from Erasmus Mundus Phoenix and a fellowship of the FRS/FRIA. NM received a fellowship of the FRS/FRIA, as well as support from the ‘Fonds David et Alice van Buuren’ and the ‘Fondation Jaumotte-Demoulin’. WN is supported by WELBIO. IM is a FNRS research associate and an investigator of WELBIO. WELBIO, the FNRS, and the Fondation Erasme supported this work. The authors declare no financial or non-financial competing interests. © 2019, Saykali et al.